HomeBlogIt doesn’t sound like an English course? It doesn’t feel like one, either. It doesn’t sound like an English course? It doesn’t feel like one, either. 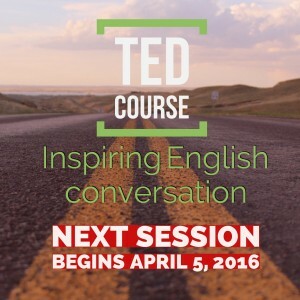 In 2014, I created Ted Course – Inspiring English Conversation taking place in my relaxing home studio which also serves as a photo studio for my husband, Photographer Christian Streili ( www.christianstreili.com). A mix of old and new, the atmosphere is cosy and relaxing. Couches, lamps, a crackling fire and the additional help of a cool glass of Prosecco. Yes, alcohol. All part of my plan to relax the English right out of my students while challenging them to use the vocabulary and phrases of real ideas. Basing each course on the TED talk that the participants themselves choose each week. What’s a TED talk? TED is a non-profit organisation (www.ted.com) based on the slogan Ideas Worth Spreading. The world’s most fascinating thinkers and doers give short talks (under 18 minutes) based on topics such as technology, design, entertainment, philosophy, business, economics, education, medicine, art and much more. The talks are filmed and free for the world to watch online and have personally been a source of inspiration to me again and again over the years. Each week the class (6-8 people) choose a talk for the following week. You prepare at home by watching the TED talk online. In class you should be ready to discuss, defend, reinforce or even change your opinion. Practicing critical thinking about interesting topics and exploring all sides of an issue is a great way to learn English, to polish your vocabulary and improve your speaking skills. Perfection is overrated; communicating your ideas well is the goal. Many people ask me why I’ve chosen to teach a class that is targeted to such a small market. English speakers who already converse quite well (B2/C1) but want a chance to be challenged and grow their language talent more. B2/C1 speakers. Yes, they are hard to find. I do it because it’s as fascinating for me as it is for the participants. It’s challenging for all involved and there’s never a dull moment when interesting people get together purely to express their opinions in English on real, current topics. Besides, it’s a great excuse for me to take out the Prosecco, pick some flowers from the garden, and create a great atmosphere. It doesn’t sound like an English course to you? That’s because it doesn’t feel like one, either. The next English Course session begins April 5, 2016 every Tuesday at 18:30 for 6 weeks. Can’t make it? Then form your own group with friends or colleagues and set your own flexible times and dates.